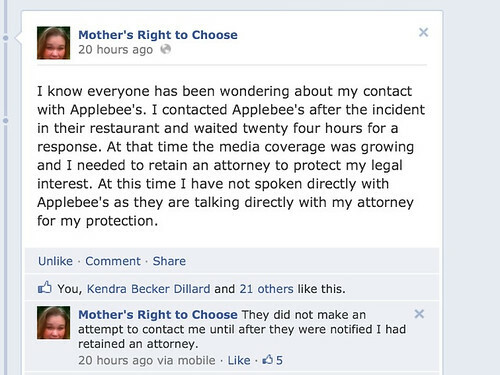 As of yesterday, Applebee's issued a new statement, one that looks a little more like an actual apology! This is good news, right? Not so fast. 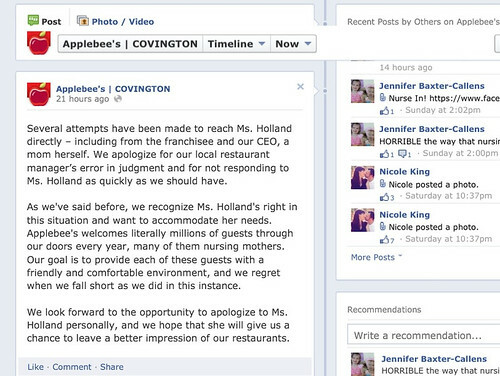 First of all, they only posted this new statement on the "Applebee's | COVINGTON" page, which has a whopping 160 likes. There's absolutely no mention of the incident or how sorry they are for the way Dawn was treated on their main Facebook page, which has nearly 3.5 million likes. I also haven't seen this apology in any of the news articles or other coverage of the incident. If Applebee's really wanted Dawn and everyone else to know how sorry they are, wouldn't they be making this statement a little more public? So let me get this straight- Applebee's didn't make any contact with Dawn, or attempt to apologize to her until after they found out that she had retained a lawyer? Call me a cynic, but that doesn't exactly make the apology seem genuine to me, especially with the other details taken into account. But I'm just one momma- take from it what you will. It's happening all over again, y'all. Yet another breastfeeding mom has been harassed for nursing in public, but this time the story is even more shocking. On September 15th, Dawn Holland was in a booth in the back of an Applebee's restaurant in Georgia, nursing her 20 month old son. The restaurant manager came up to Dawn and told her that what she was doing was inappropriate, and that she'd either need to stop or take her son into the bathroom to nurse him. Dawn refused to do either, and asked the manager to look up the Georgia law on breastfeeding, which clearly states that women are free to nurse their children anywhere they are legally allowed to be. I'm sure most of my readers have already seen this story and know what happened next. But if you haven't, just take half a second and guess. Manager asks mom to nurse in the bathroom, mom refuses and asks manager to look up the state law. Logically, a couple of scenarios could have played out. The manager could have walked back to her office, done a quick google, and realized that Dawn did, in fact, have the right to nurse in the restaurant! Aside from the initial harassement and lack of understanding of basic human biology, that sounds somewhat reasonable conclusion to the incident. Or maybe the manager refused to budge, and Dawn and her children left, frustrated and offended. That's been the outcome of several similar nursing in public harassment incidents. But neither of those scenarios are what actually happened. Not only did the manager not go look up the Georgia law, not only did she continue to insist that Dawn stop nursing or go to the bathroom, she proceeded to CALL THE POLICE. Yep, you read that right. When faced with a peaceful, nursing mother in her restaurant, this manager decided the right course of action was to call the police. I'm really trying not to be rude. But I honestly don't understand what in the world would posess someone to call the actual police because a mother is nursing her child! Don't the police have actual crimes to stop? What kind of person would think that the act of a mother feeding her child is not only offensive, but a crime worth calling the police over? Consider my mind blown. "We're in the business of welcoming guests to our restaurants and our top priority is always to provide a friendly and comfortable environment for everyone, including nursing mothers who have the right to nurse in public. (Look at that- Applebee's can regurgitate Georgia law! Now can they take it a step further and actually apologize to Dawn?) This was an unfortunate misunderstanding(A what? A misunderstanding? What exactly was it that was misunderstood? The fact that nursing is the biologically normal way to feed a child, not a crime worth calling the police over? Yeah, there was definitely a misunderstanding there. Maybe the fact that Dawn was harassed and humiliated when she had done absolutely nothing wrong, and deserves an apology? Yes, you've obviously misunderstood that too, Applebee's, given the fact that you haven't even had the decency to apologize to her!) and we hope the guest will give us another chance to demonstrate that to her personally. (Really? You harass this woman, call the police on her for absolutely no reason, weasel your way out of an actual apology by calling the whole thing a "unfortunate misunderstanding", and then you expect her to actually darken your doorstep and give you another chance? I'm betting that's not going to happen.)" Yeah, really good job there, Applebee's. The other thing that really frustrates me about this entire incident is that the manager that called the police on Dawn was a woman! I shouldn't still be surprised by this, but I am. Silly me for expecting women to stick up for each other, and understand the basic concepts of motherhood and female biology! We've seen this before, of course, most notably(for this blog, anyway) during the Pure Fitness incident when Penny Schlanser was harassed for nursing in a women only gym. The women that were offended by Penny nursing even came out and held their own counter protest during our nurse in. 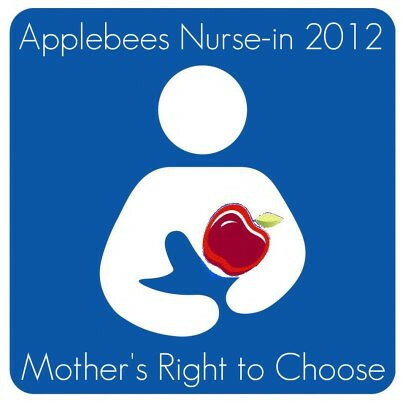 As usual when a nursing mom is harassed, especially in such a blatant manner as Dawn was, the nursing community has organized a nurse-in, which is to be held on Saturday, September 29th from 1-3PM at Applebee's locations all across the country. I plan to be there with a sign saying something like "Breastfeeding isn't a Crime" or "Nursing is Normal" or "End Discrimination against Nursing Mothers". This has got to stop, y'all. For every nursing mom who gets harassed and makes the news for it, there are at least dozens more that we don't ever hear about. It's completely unacceptable that women are still being harassed for taking care of their children in the most basic way possible. News coverage of the incident, including a news segment and an interview with Dawn. Dawn is also scheduled to be on Katie Couric's new show on Wednesday. Lets hope Katie is more supportive of breastfeeding on the air than she is on her website, where she posted this gem. She asks, "Should women breastfeed in public?" Gosh, I dunno, Katie. Should women bottle feed in public? Should mothers feed Cheerios to their todders in public? Should adults eat sandwiches in public? Are we really still asking this question? I sincerely hope Katie educates herself on both this issue and the law before her interview with Dawn on Wednesday. If you want to take part in the nurse-in as well, I encourage you to visit the Facebook group where it's being organized. There's a list of local nurse-in's by state, many with their own Facebook group for more localized organizing. If this will be your first nurse-in, I encourage you to check out this information from Best for Babes about nurse-ins. It explains what to expect, what the point of a nurse in is, and what to do and not do during the nurse-in. Let's do this! We'll continue to stand for nursing mothers and babies until breastfeeding becomes so normal that no one bats an eye at it- and especially until nursing mothers don't have to fear having the police called on them.